The UK’s leading woodland conservation charity is encouraging poultry keepers to plant trees on their land to provide natural cover for their hens and increase the quality of the eggs they produce. Chickens foraging amongst trees. Photo courtesy of Peter Dean. Trees offer a range of significant benefits to hens, and the Woodland Trust is looking for people who own hens to consider tree planting on their land in time for this year’s autumn/winter planting season. 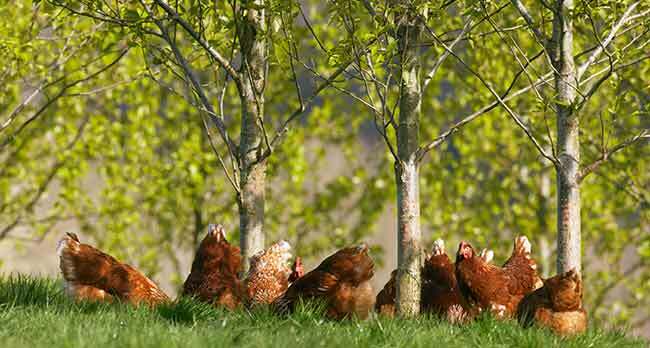 Research shows trees encourage hens to range further, increases their confidence and reduces any stress, which is common amongst poultry. This combination has a positive impact on the hens’ overall welfare and egg quality. John Tucker, Woodland Creation Director at the Woodland Trust, said: “As well as improved hen welfare and egg quality, tree planting also offers a number of other benefits to small holders. Trees planted as shelter belts can act as wind breaks and provide wood fuel, and various wildlife species, including birds, mammals and insects will also be able to flourish within this much-needed habitat. No previous tree planting experience is necessary as specialists from the Trust will work with all applicants as part of the charity’s MOREwoods scheme to make sure only the most suitable trees are planted in the right areas.